Disney Alice in Wonderland. WDW Hidden Mickey Cheshire Cat from Walt Disney World. This Cast Lanyard pin features Cheshire Cat from Alice in Wonderland. It is part of a four-pin, Cat Collection/Series and has a backstamp that says, "1 of 4." This pin is part of the Hidden Mickey Series 2 Collection at the Walt Disney World® Resort. 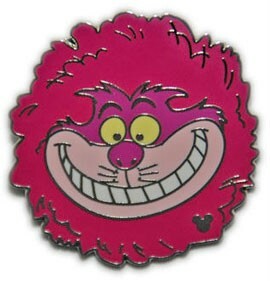 Pin shows Cheshire Cat's head smiling and the head appears to be place on a round pink pillow. There is a small hidden Mickey in the lower right hand corner.